Step 1. Defining the portfolio problem. Step 2. Simulating asset prices. Step 3. Setting up the Portfolio object. Step 4. Validate the portfolio problem. Step 5. Plotting the efficient frontier. Step 6. Evaluating gross vs. net portfolio returns. Step 7. Analyzing descriptive properties of the Portfolio structures. Step 8. 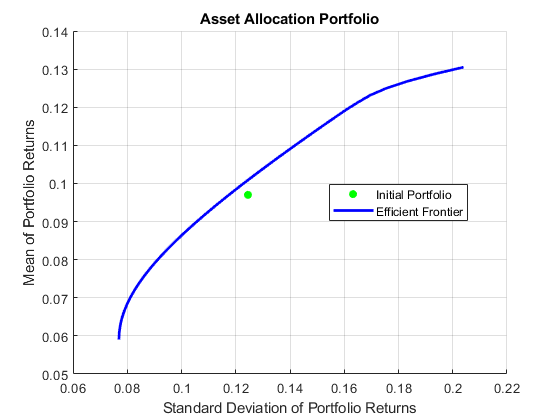 Obtaining a Portfolio at the specified return level on the efficient frontier. Step 9. Obtaining a Portfolio at the specified risk levels on the efficient frontier. Step 10. Displaying the final results. 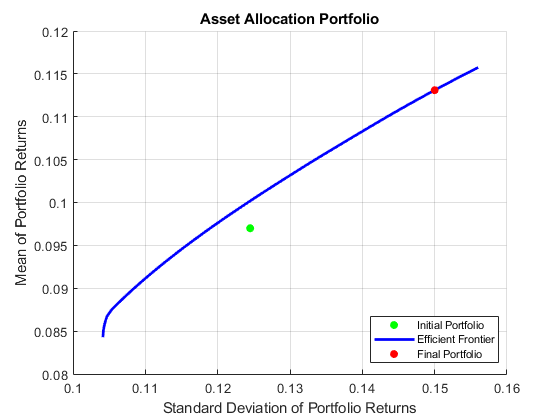 This example shows how to set up a basic asset allocation problem that uses mean-variance portfolio optimization with a Portfolio object to estimate efficient portfolios. Suppose that you want to manage an asset allocation fund with four asset classes: bonds, large-cap equities, small-cap equities, and emerging equities. The fund is long-only with no borrowing or leverage, should have no more than 85% of the portfolio in equities, and no more than 35% of the portfolio in emerging equities. The cost to trade the first three assets is 10 basis points annualized and the cost to trade emerging equities is four times higher. Finally, you want to ensure that average turnover is no more than 15%. To solve this problem, you will set up a basic mean-variance portfolio optimization problem and then slowly introduce the various constraints on the problem to get to a solution. To set up the portfolio optimization problem, start with basic definitions of known quantities associated with the structure of this problem. 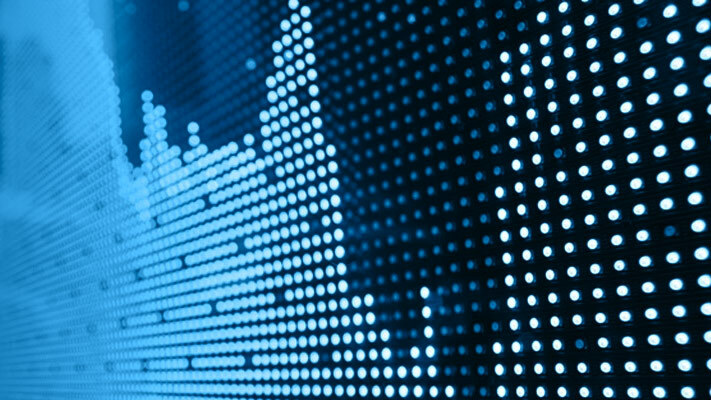 Each asset class is assumed to have a tradeable asset with a real-time price. Such assets can be, for example, exchange-traded funds (ETFs). The initial portfolio with holdings in each asset that has a total of $7.5 million along with an additional cash position of $60,000. These basic quantities and the costs to trade are set up in the following variables with asset names in the cell array Asset, current prices in the vector Price, current portfolio holdings in the vector Holding, and transaction costs in the vector UnitCost. To analyze this portfolio, you can set up a blotter in a dataset object to help track prices, holdings, weights, and so forth. In particular, you can compute the initial portfolio weights and maintain them in a new blotter field called InitPort. The mean and covariance of annual asset total returns are maintained in the variables AssetMean and AssetCovar. The simulated asset total return prices (which are compounded total returns) are maintained in the variable Y. 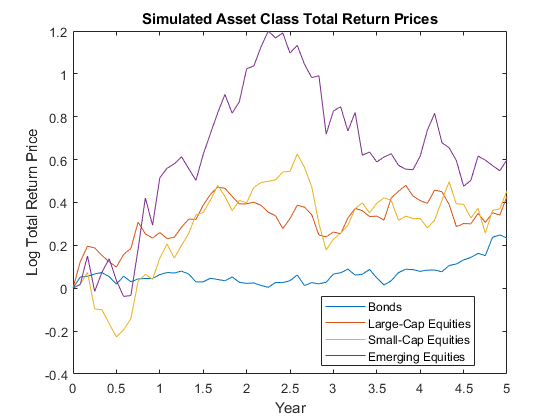 All initial asset total return prices are normalized to 1 in this example. Portfolio weights are nonnegative and sum to 1. Equity allocation is no more than 85% of the portfolio. Emerging equity is no more than 35% of the portfolio. These specifications are incorporated into the Portfolio object p in the following sequence of using functions that starts with using the Portfolio object. The specification of the initial portfolio from Blotter gives the number of assets in your universe so you do not need to specify the NumAssets property directly. Next, set up default constraints (long-only with a budget constraint). In addition, set up the group constraint that imposes an upper bound on equities in the portfolio (equities are identified in the group matrix with 1's) and the upper bound constraint on emerging equities. Although you could have set the upper bound on emerging equities using the setBounds function, notice how the addGroups function is used to set up this constraint. To have a fully specified mean-variance portfolio optimization problem, you must specify the mean and covariance of asset returns. Since starting with these moments in the variables AssetMean and AssetCovar, you can use the setAssetMoments function to enter these variables into your Portfolio object (remember that you are assuming that your raw data are monthly returns which is why you divide your annual input moments by 12 to get monthly returns). Use the total return prices with the estimateAssetMoments function with a specification that your data in Y are prices, and not returns, to estimate asset return moments for your Portfolio object. Although the returns in your Portfolio object are in units of monthly returns, and since subsequent costs are annualized, it is convenient to specify them as annualized total returns with this direct transformation of the AssetMean and AssetCovar properties of your Portfolio object p.
Display the Portfolio object p.
An important step in portfolio optimization is to validate that the portfolio problem is feasible and the main test is to ensure that the set of portfolios is nonempty and bounded. Use the estimateBounds function to determine the bounds for the portfolio set. In this case, since both lb and ub are finite, the set is bounded. Given the constructed Portfolio object, use the plotFrontier function to view the efficient frontier. Instead of using the default of 10 portfolios along the frontier, you can display the frontier with 40 portfolios. Notice gross efficient portfolio returns fall between approximately 6% and 16% per years. The Portfolio object p does not include transaction costs so that the portfolio optimization problem specified in p uses gross portfolio return as the return proxy. To handle net returns, create a second Portfolio object q that includes transaction costs. The results show that the cost to trade ranges from 14 to 19 basis points to get from the current portfolio to the efficient portfolios at the endpoints of the efficient frontier (these costs are the difference between gross and net portfolio returns.) In addition, notice that the maximum efficient portfolio return (13%) is less than the maximum asset return (18%) due to the constraints on equity allocations. A common approach to select efficient portfolios is to pick a portfolio that has a desired fraction of the range of expected portfolio returns. To obtain the portfolio that is 30% of the range from the minimum to maximum return on the efficient frontier, obtain the range of net returns in qret using the Portfolio object q and interpolate to obtain a 30% level with the interp1 function to obtain a portfolio qwgt. The target portfolio that is 30% of the range from minimum to maximum net returns has a return of 7.9% and a risk of 9.1%. Although you could accept this result, suppose that you want to target values for portfolio risk. Specifically, suppose that you have a conservative target risk of 10%, a moderate target risk of 15%, and an aggressive target risk of 20% and you want to obtain portfolios that satisfy each risk target. Use the estimateFrontierByRisk function to obtain targeted risks specified in the variable TargetRisk. The resultant three efficient portfolios are obtained in qwgt. The final result is a blotter that contains proposed trades to get from your current portfolio to a moderate-risk portfolio. To make the trade, you would need to sell 16,049 shares of your bond asset and 8,069 shares of your small-cap equity asset and would need to purchase 23,986 shares of your emerging equities asset. The final plot uses the plotFrontier function to display the efficient frontier and the initial portfolio for the fully specified portfolio optimization problem. It also adds the location of the moderate-risk or final portfolio on the efficient frontier.